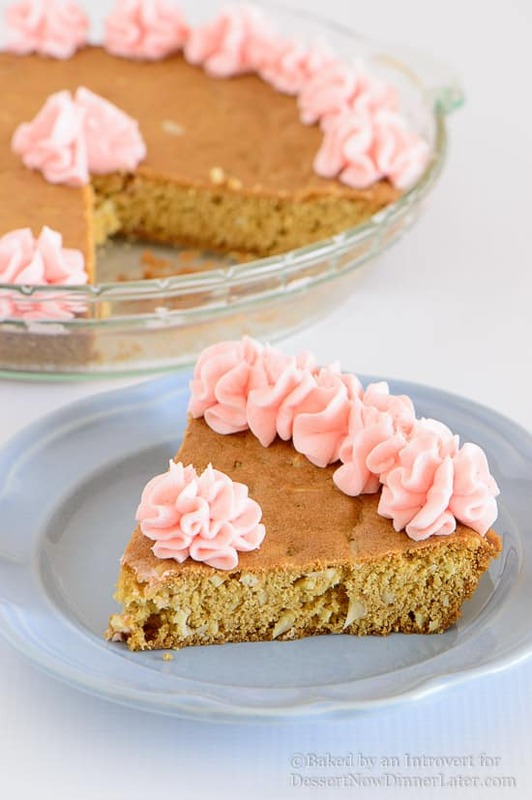 Almond Cherry Sugar Cookie Cake - Dessert Now, Dinner Later! Almond flavored sugar cookie cake with slivered almonds throughout and topped with cherry frosting. 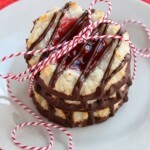 The best sugar cookie you will ever have! Hi friends! I’m Jen from Baked by an Introvert and I’m back with a recipe for the best sugar cookie you will ever taste! Do you have a go to recipe for birthdays or special occasions? Typically those recipes are a cake of some sort. Am I right? Well, it’s time to change it up and step outside the box. 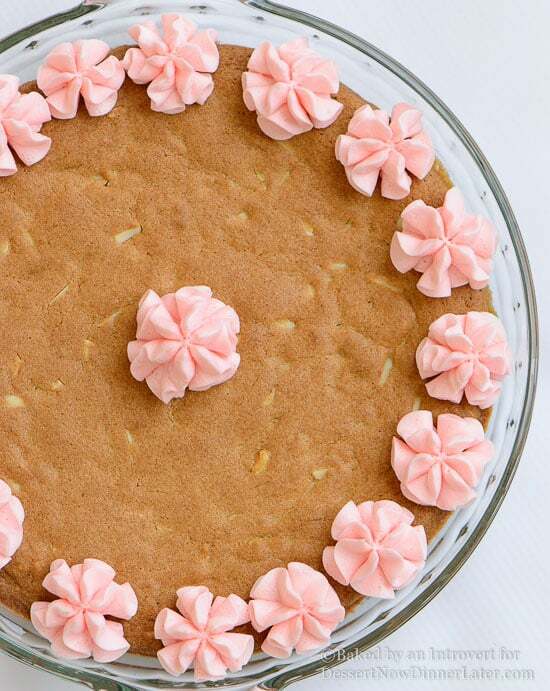 That’s where this super easy cookie cake comes in. 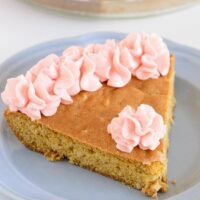 It’s loaded with almond flavor, has slivered almonds throughout, and the cherry frosting is to die for. The recipe is quite simple. Mix the wet ingredients, mix the dry ingredients, and then combine the two. This is a common technique in most baking recipes. I used one egg and one egg yolk in this recipe. Using the extra yolk provides just the right amount of moisture so that the cookie isn’t overly moist and gooey. I was aiming for a crunchy texture, much like the sugar cookies you get in the grade school cafeteria. 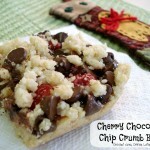 The goal was to have a cookie that would crumble and melt in your mouth. Spread the batter into a 9-inch pie dish. A very important thing to note: make sure you use a deep pie dish and not a shallow one. I first tried this in my shallow dish with largely angled sides. The cookie baked up and spilt over the edges resulting in a sunken center. Although it was still tasty, it was very unattractive. The cookie needs to bake for around 25 to 30 minutes. Watch it closely at around 20 minutes. Every oven is different and you may need to remove yours sooner if begins to get too brown. Let the cake cool and it’s ready to be frosted. I made a thick cherry frosting using basic buttercream ingredients and flavored it with maraschino cherry juice. 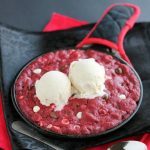 If you think you will want more of the cherry flavor, you can also mix a half cup of drained cherries into the cookie batter before baking. Cherry and almond pair wonderfully together. This sugar cookie cake is perfect for when you want to do something different for a birthday or special occasion. 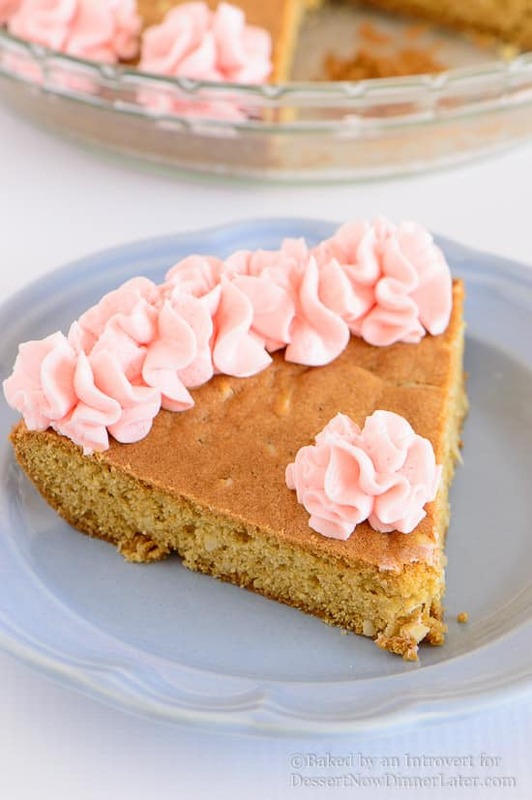 Almond sugar cookie cake with slivered almonds throughout and topped with cherry frosting. The best sugar cookie you will ever have! In a large mixing bowl, beat together the butter and sugar until fluffy. Beat in the egg, egg yolk, and almond extract. In a separate bowl, combine the flour, salt, and baking soda. Stir with a whisk. Add the flour mixture to the butter mixture. Mix just until moistened. Fold in the slivered almonds. 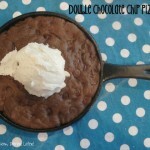 Spread the batter evenly into a 9-inch pie pan. Bake for 25 to 30 minutes or until lightly browned and cooked through. Cool completely on a wire rack. Make the frosting: Beat the butter and powdered sugar together until smooth. Add the cherry juice, beat until incorporated. Frost the cookie cake as desired. For a stronger cherry flavor, mix ½ cup of drained maraschino cherries into the batter with the slivered almonds. Keep in mind this will change the texture of the cake since the cherries will leak moisture into the batter. This sugar cookie cake is gorgeous, Jen! Love the soft pretty pink frosting and the cherry and almond combo sound perfect! Delicious Jen! This sugar cookie cake looks divine and I love your beautiful presentation of it. 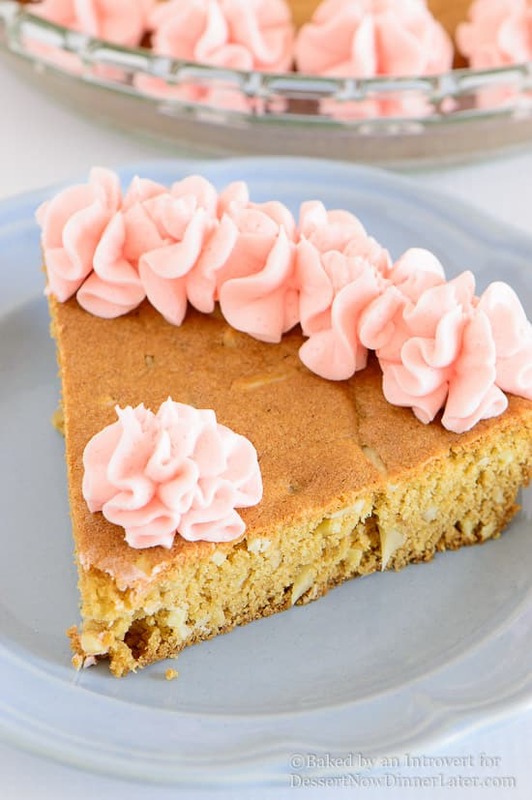 I’ve always wanted to try sugar cookie cake, and this seriously looks SO gorgeous I think I may have to give it a go! Absolutely loving that gorgeous pink frosting! Pretty photos too, girl!